Preheat oven to 250 F. Note oven can be lower for longer simmer time (the longer the better) or higher for shorter simmer time if you’re in a hurry. But note that this should simmer for a minimum 4 hours. Place bread crumbs into large bowl, pour red wine over mix until wine is all absorbed into bread crumbs. Grate the onion into mixture. Add garlic, eggs, mustard, parmesan, add seasonings. Mix well, form into meatballs, about 2 to 3 inches in size. Add three tablespoons of olive oil in large frying pan and heat. Once oil is hot place meatballs into pan and brown, DO NOT CROWD, work in batches.. Once meatballs are browned place into a large oven-proof pot, that has two cans of tomato sauce in already in bottom of pot. Once all meatballs are in pot add more tomato sauce to cover meatballs, bring to a simmer then place in oven. Oven should be at 250 degrees. Leave for 4-6 hours. In a pot heat oil add onion cook until soft, then add hamburger and brown. Once hamburger is browned add salt and pepper to taste. Then add celery, mushrooms and garlic. Stir in well and cook for 3 minutes. Add tomato sauce then the spices, stir well bring to simmer just slight bubbling on the surface. Place in oven with meatballs and leave for 6 hours. 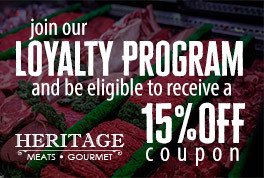 For the latest on upcoming promotions and events, subscribe by simply entering your email address below. 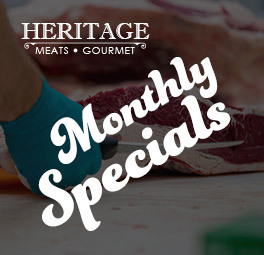 Copyright © 2019 Heritage Meats Gourmet. All Rights Reserved. Vote for Langley’s Finest and Win!